The Medscope MedsCK module has been updated to comply with all the 6CPA Medication Review requirements. MedsCheck cap warning. MedsCK will warn the pharmacist if a MedsCheck is initiated that will exceed the 6CPA cap of 10 MedsChecks a month. The pharmacist can opt to either continue or cancel the service. New Recommendations section to record the types of recommendations made to the patient during the MedsCheck. This data is required to complete the new 6CPA claim sheet. Consent form. The new 6CPA rules require the patient to sign the Australian Privacy Principles Notification form (which we have named Consent form). The form must be printed, signed by the patient and retained by the pharmacist. MedsCK prefills the form for you. 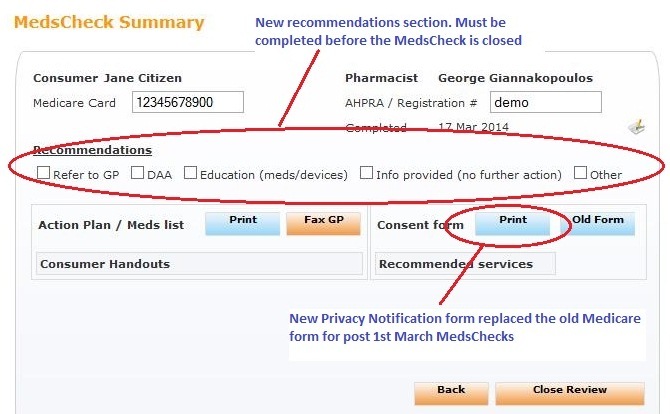 The old Medicare form is still available for claiming MedsChecks that were performed prior to the 1st of March ... and will be removed after the 30th of April when the claiming cut-off expires. Note: The Old Form is not required for any MedsChecks performed post 1st March. New 6CPA claim sheet. MedsCK has replaced the old Medicare claim cover page with the new 6CPA Excel spreadsheet. Even though MedsCK pre-fills the claim sheet, you must always check the data before lodging. The claiming process has not changed. The new 6CPA claim sheet can be re-generated when required. The old Medicare claim cover page will still be available in MedsCK for pre 1st March claims ... until the 30th of April, when the claim cut-off expires.